It can be tough working on a maker project if you don’t have a good space to work. Many times my electronics work surface was an ESD mat on the dining room table, but as my projects grew and my family grew I was under increasing pressure to find somewhere else to work. (Really it was the 3D printer that put my wife over the edge — rightfully so). I also didn’t want to have my electronics out in the garage which is my woodworking shop and full of saw dust. The task of finding a decent place to work on electronics was more of a challenge than I expected. Lots of folks who left the dining room table seem to work on card tables or random repurposed Ikea tables and benches or purchase very expensive commercial electronics benches that are out of the range of most folks working part time as a maker. I knew there must be something in the middle that could be a reasonable solution and a reasonable bench. As I was reading my copy of “Practical Electronics For Inventors: 4th Edition” by Paul Scherz and Simon Monk there was a brief mention of a DIY Maker Workbench that caught my eye. If you have the book it is on pages 632-633, but be careful as you might miss it buried deep in the bowels of this tome, with just a brief description and a couple of diagrams but no photos of it in use. I wanted to rectify that problem and document how I built mine as I had to make some modifications and additions that I thought others might be interested in. Since the the book above was written the 18″ deep metal frame that was the basis of the bench is no longer available through Home Depot and the company that made it seems to have been swallowed up by another company, but they still make and stock a 24″ deep version. I’ve compiled a hardware list below that includes all the materials I used along with links for anything that was not a simple commodity item. With the instructions from the book and my additions below I’m sure you can build yourself a great electronics/maker workbench. Working on the slab for the bench top. 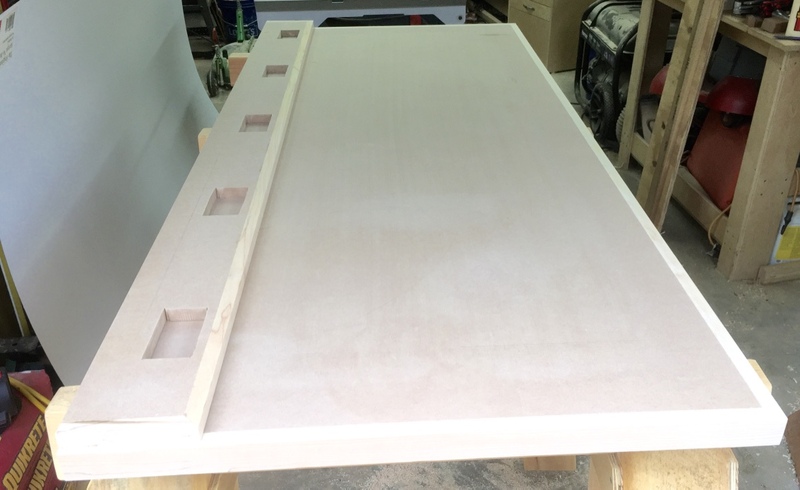 Two pieces of CDX plywood topped off with a sheet of MDF. 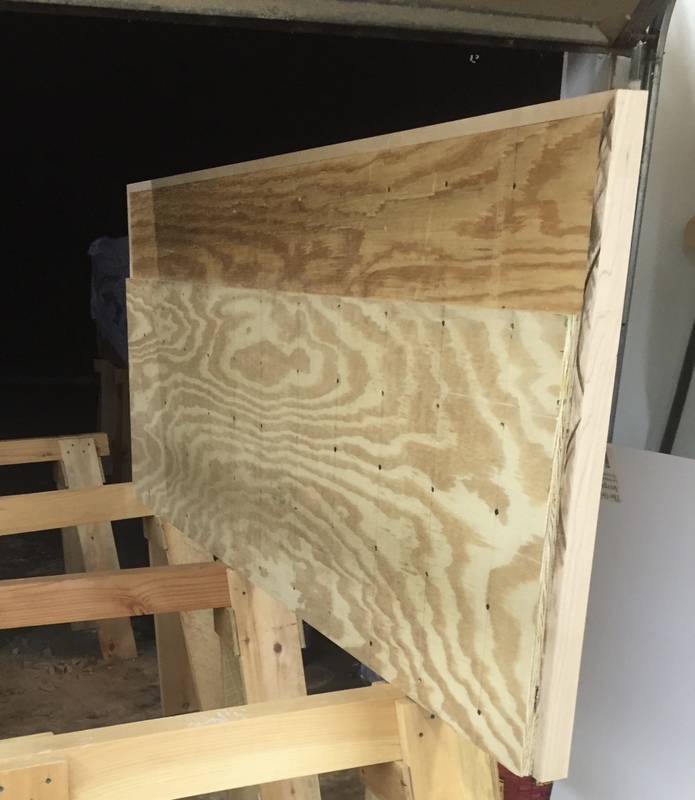 I ripped the plywood and MDF on the table saw and cross cut it using a circular saw with a guide fence leaving it about 1″ too long on purpose. Once I screwed the layers together I was able to use the guide fence to cross cut it again to final size — by doing this I know all my layers will be perfectly lined up. Make sure to account for the edging when you figure out how big your bench will be. If you work carefully you’ll want to shoot for a bench top that is about 1/4″ narrower that the metal frame is wide. That should leave a nice 1/8″ shadow line and give you room to get it seated. Also the metal is not always welded all that great on these frames as I know mine was not 100% square and many get damaged in shipping and need to be bent back into shape. Attaching the Hard Maple edge banding to the slab. Next up I milled some hard maple stock to be the edging for the bench slab. I carefully mitered each quarter and used a biscuit joiner and glued in biscuits to secure the edging. 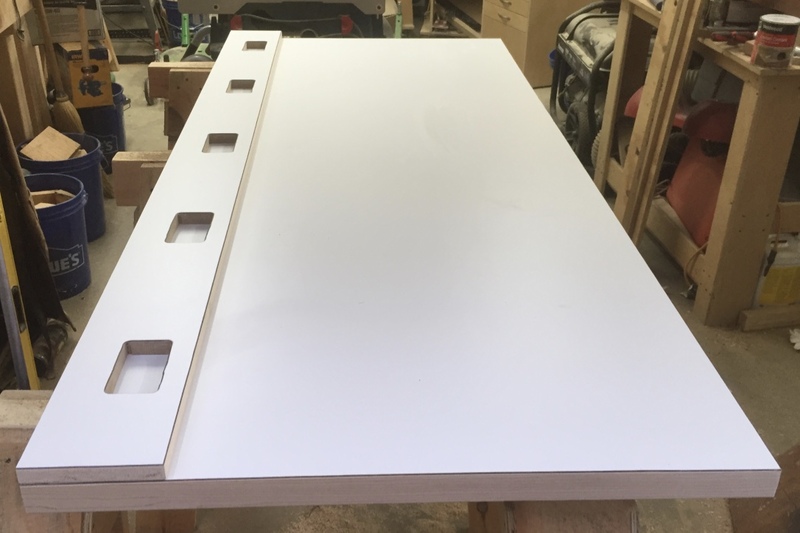 (By using biscuits there are no nail holes to fill in) Also note that the edging should only cover the top two layers of substrate — the MDF and first layer of plywood as the lowest layer of plywood is what keys the bench top into the center shelf of the metal frame. I used edge clamps to secure the edging as it dried. Grid layout for screwing together the bench top. When screwing together the 3 layers of substrate I laid out a grid on the bottom of each layer that way my screws were spaced evenly. It also allowed me to make sure my screws would not directly overlap between layers. Cutting holes for outlet boxes in the rear skirt for the bench top. When cutting the outlet holes for the back splash I laid them out evenly and then marked out where they would be. I drilled a small hole in each corner and a large one in the center with enough room to allow the blade of my jig saw to fit. 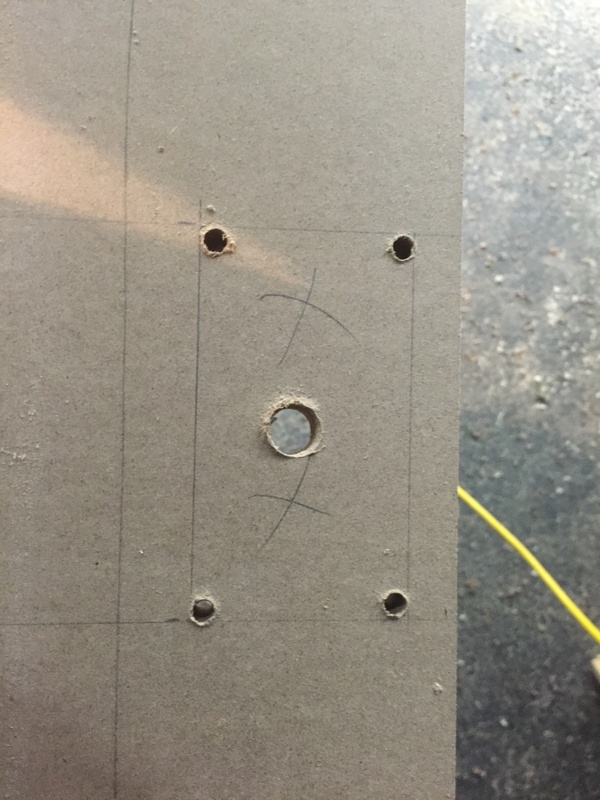 I sawed out the space for each outlet looking to be about 1/16″-1/8″ larger than the outlet box. I also used a file and rasp to clean up any rough edges. Hard maple banding around the rear skirt as well. With the outlet holes in place I edged the back splash with hard maple to match the bench surface and to reinforce the MDF substrate. 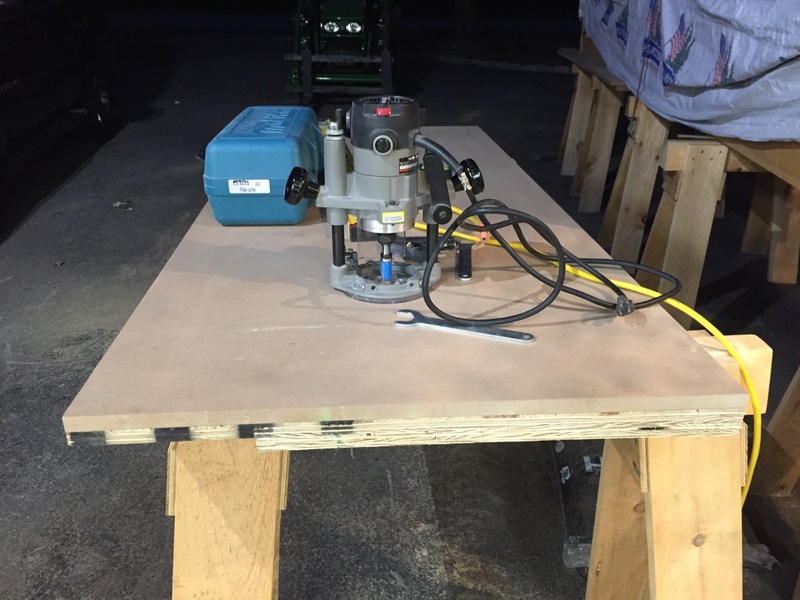 I rough cut the formica a couple inches bigger in each direction for what it needs to cover using saw blade with a high number of teeth — 40-60 or a dedicated laminate blade would work. 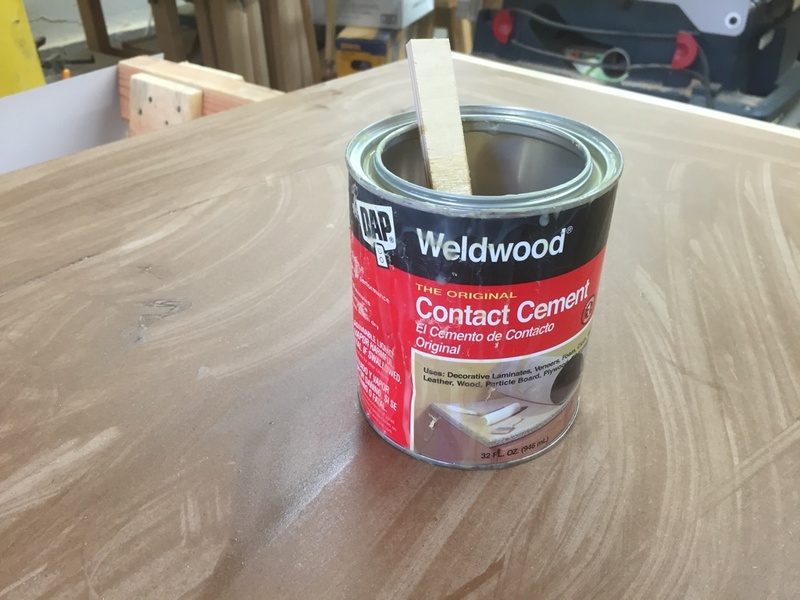 Then it was time to apply the contact cement. 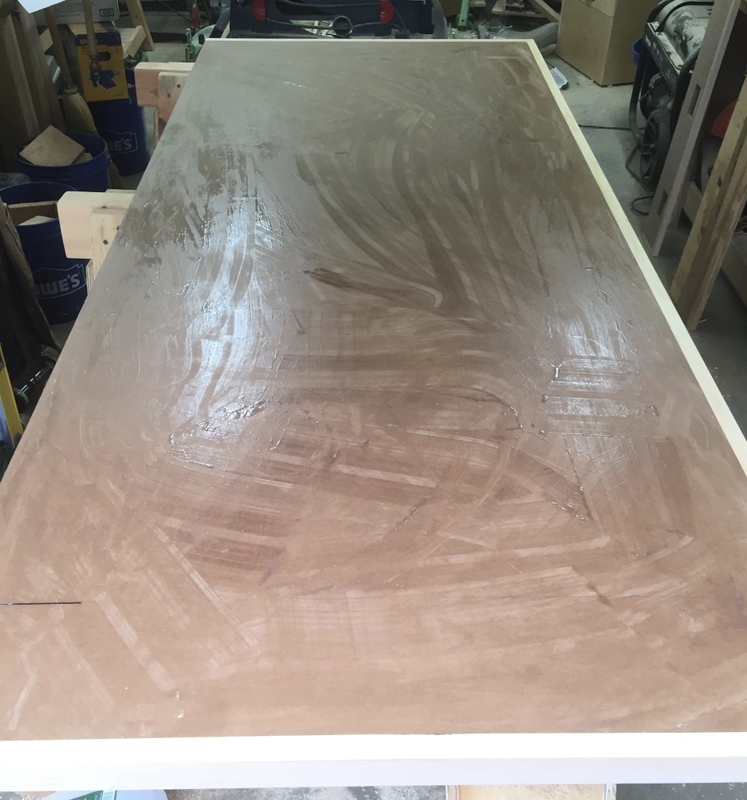 The MDF will generally absorb more than the formica as it is more porous. You want to apply it liberally and evenly using a brush, roller or spatula and bit of cardboard. As it dries you’ll see where you need some more as you go. When it dries to the point that it is evenly tacky — meaning your finger will stick to it a bit — it’s time to apply the Formica. I usually put a few dowels out on the bench substrate and then get the Formica all lined up but not touching each other. Once the two tacky surfaces meet they cannot be pulled apart so you need to get this right the first time and the dowels help you to get the alignment right before committing to it. That is also why we cut the sheet larger and trim it back once secured. Start from the center and work your way out using a J-Roller applying as much force as you can muster. 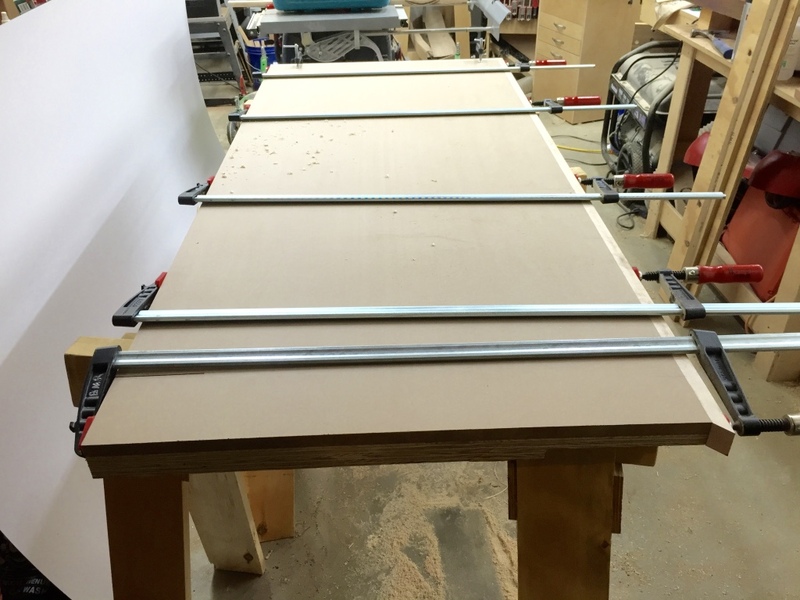 As you work your way out to the edge you can remove more dowels until the Formica is in place. Then keep working the J-Roller until you get rid of any/all air pockets and bubbles taking longer and longer strokes working from the center out and then end to end. To trim the Formica I use a flush cutting router bit in a router to trim back the laminate so that it is flush with the edging. I then take a 1/8″ radius round over bit to ease all the edges with the hard maple. 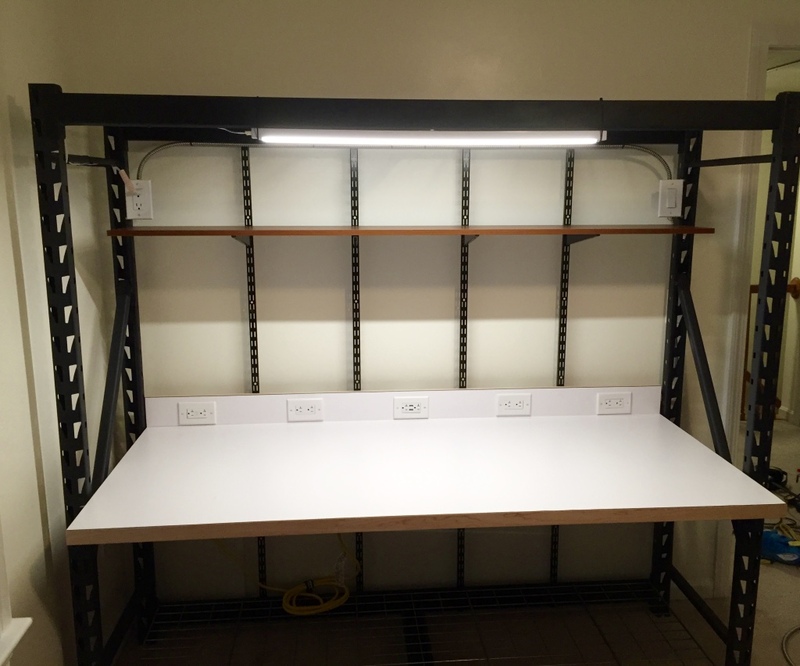 With the bench top complete it was time to move on to the electrical work and assembly. 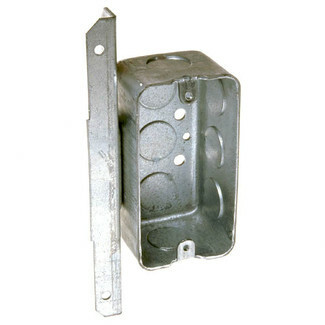 For outlets make sure you get all of them with the right angle bracket as shown above and as shown here. That bracket is needed in order to secure the outlets to the back splash on the bench top and for the upper outlets to attach them to the metal frame. 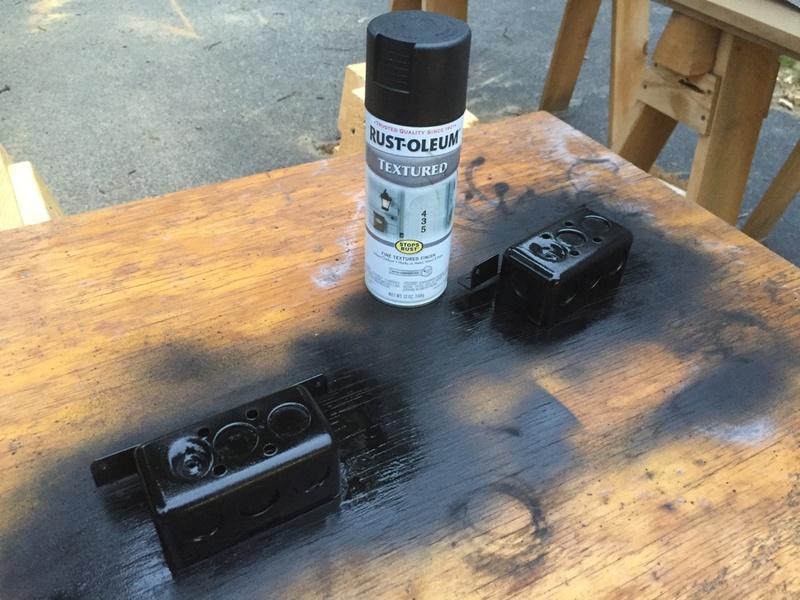 Spray painting the two visible outlet boxes black. I used Rustoleum Black Textured paint to paint the two outlets that will be for the light switch and its outlet since they will be visible. 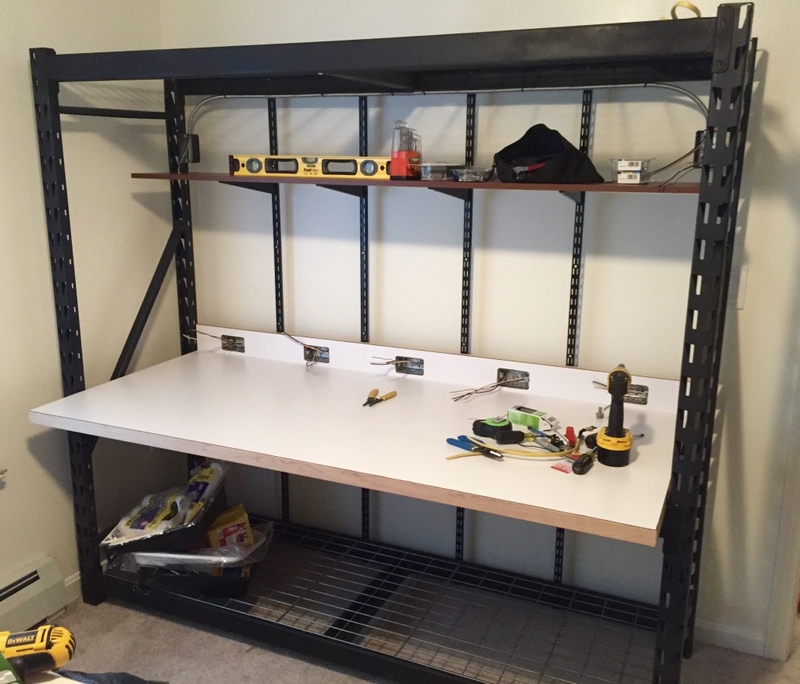 I also bought that can of paint to match the finish on the metal shelving/rack that is the core of this bench since mine came from HomeDepot.com and had lots of rub spots on it from shipping and that would have bothered me to see every day. Wiring up the back of the bench. 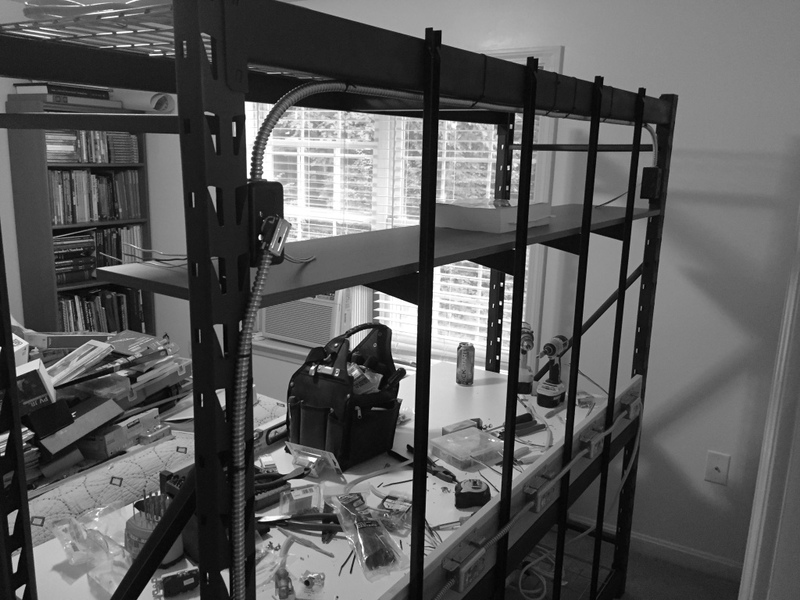 I assembled the metal shelving rack as per the instructions it came with and the height of the shelves roughly in line with what the book described. Once assembled take a chair and sit at it and make sure its at a comfortable height to do your electronics work — likely a couple inches higher than what I’d want for typing at a computer. Then lift the bench top into place — you’ll want help with this as its HEAVY and I have mine in our spare bedroom upstairs so I dread moving it sometime in the future. 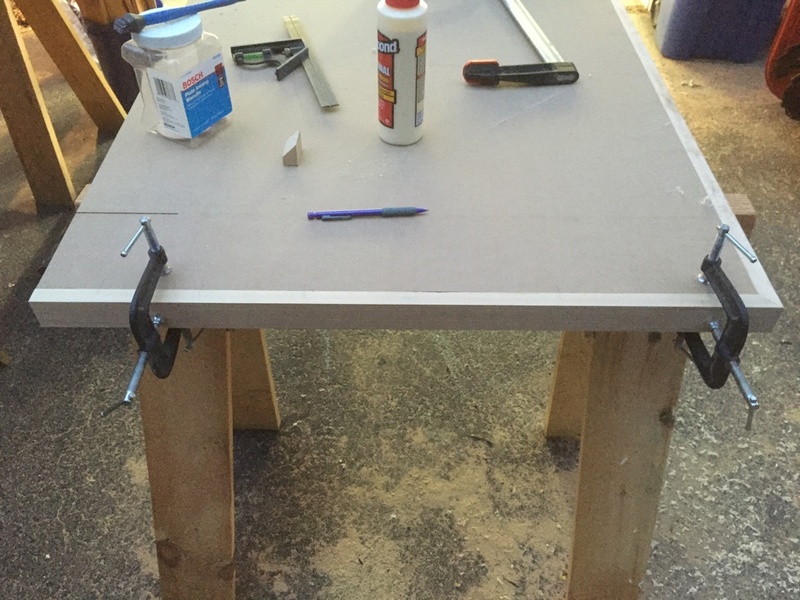 I attached the backsplash to the bench top using 2″ wood screws — note I say wood screws and not drywall screws which are flimsy in comparison — drywall screws have much thinner shanks that can easily snap. I then punched out the necessary holes in the outlets and screwed them into place with 5/8″ long screws. Mark and number the locations for the shelving supports. 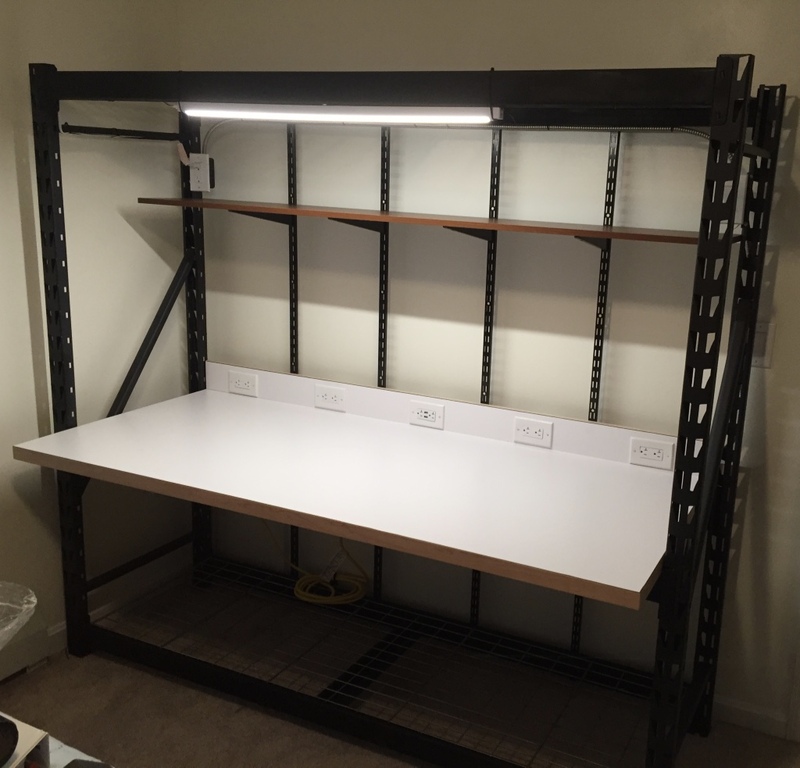 I used 4 shelf uprights for my bench as I felt the two called out in the book would be too flimsy especially as my shelves will be covered in books and hardware and I don’t want the shelves to droop. I measured out locations that would space the uprights equally and marked the uprights and the bench with a silver sharpie and numbered them so if I have to move this bench I can re-assemble it with the exact same pieces in the same location. 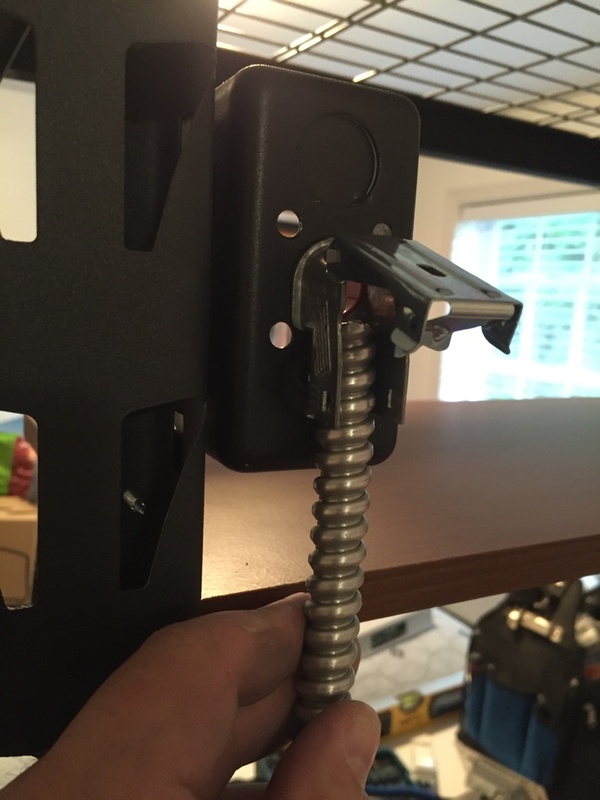 Install the shelving supports with self tapping metal screws. I then took a center punch (or in a pinch a nail set would do) and using a hammer I hit the location I want to drill through the metal hard in order to make a small dent. This will help the drill bit stay where I want it as I drill through the metal. 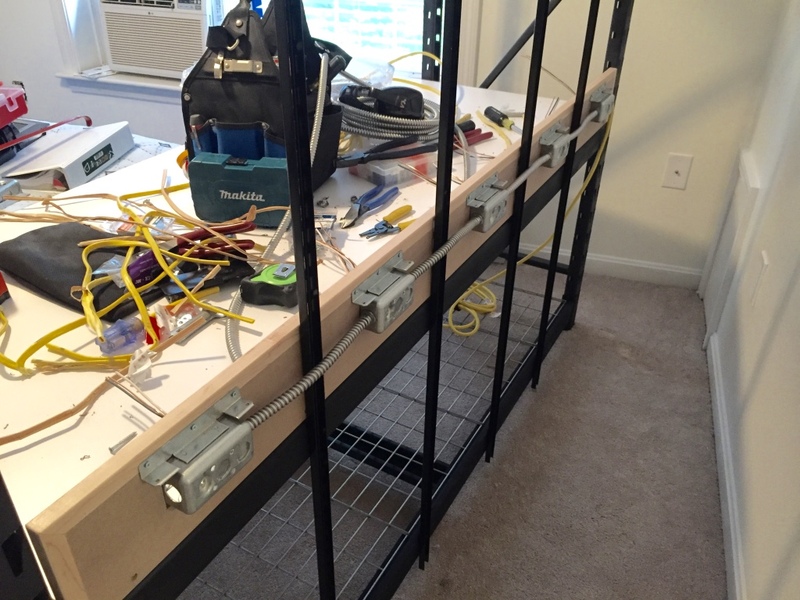 I secured the shelf supports to the top, middle and bottom rails of the metal shelving. I also wanted to make sure they were evenly spaced between the outlets as the armored cable will need to work around them as we’ll see below. 12-2 Romex cable. Remove the yellow outer jacket. 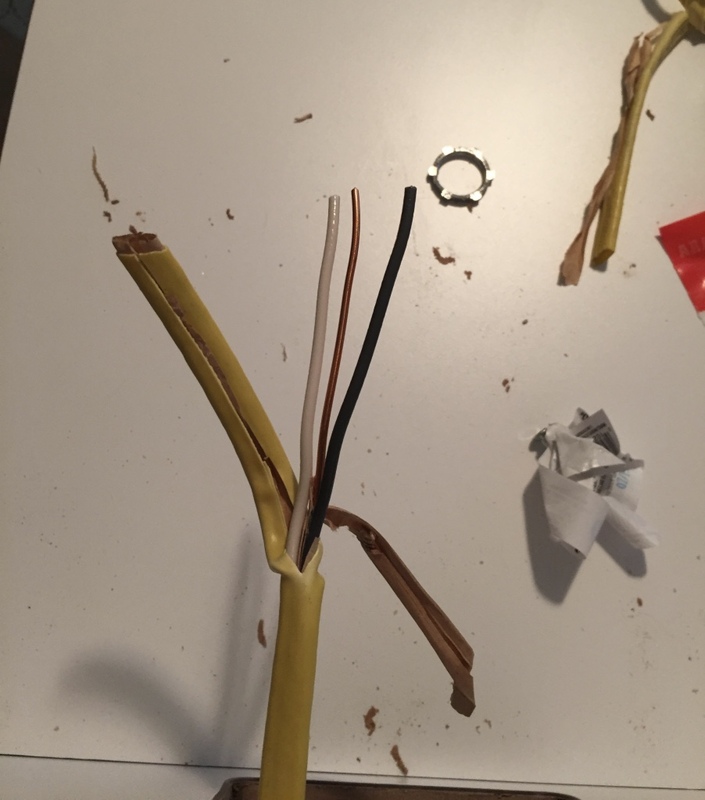 I cut the cable a solid amount longer than the distance between each box so I would have plenty of 12 gauge wire to work with. I then stripped off the yellow rolex wire jacked as these wires will be fed through the BX metal cable armor and fittings. Make sure to leave a generous amount of wire on each end of the armor so you have room to make your connections in the outlet box. I cut each bit of cable armor to size and test fit it with the fittings as shown above. 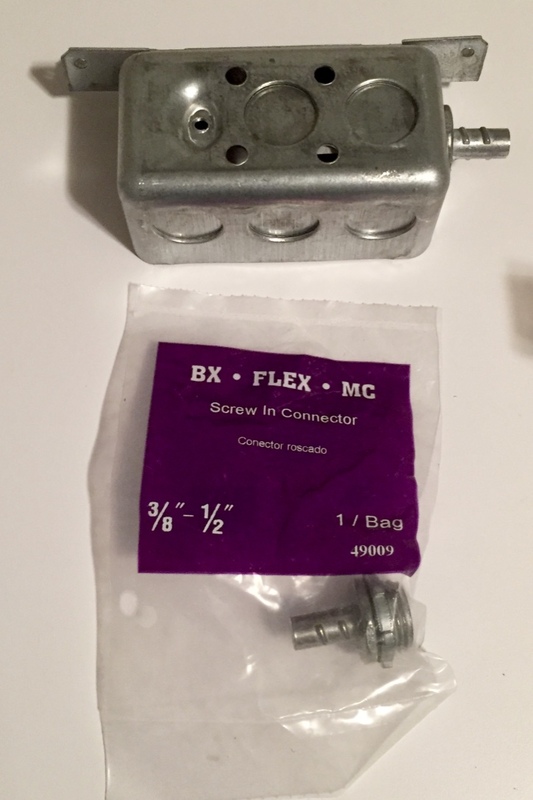 I then fed the wire through the armor and installed each assembly into the appropriate outlet boxes and secured the nuts that hold the fittings in the outlet boxes. (see below). Note that the armored cable goes behind the shelf supports. 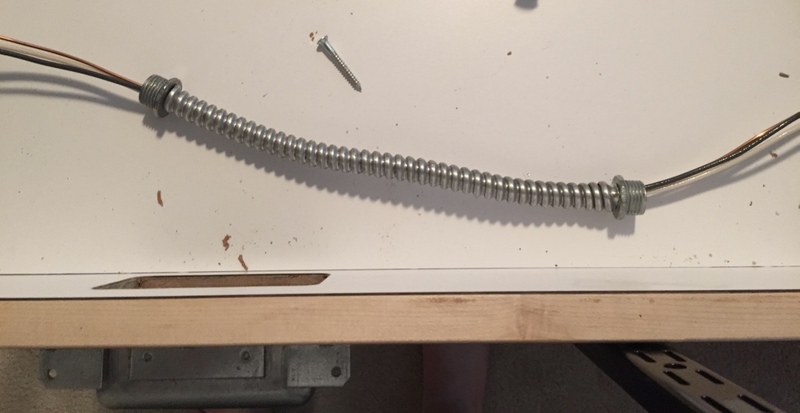 Use a heavy duty 12 gauge or heavier extension cord to connect your bench to the wall outlet. 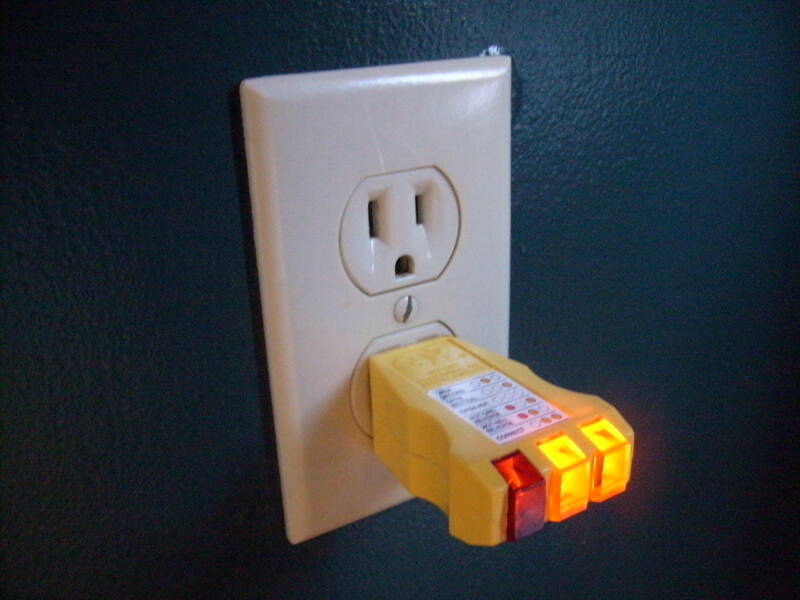 You’ll cut off the female end and wire it into the GFCI. 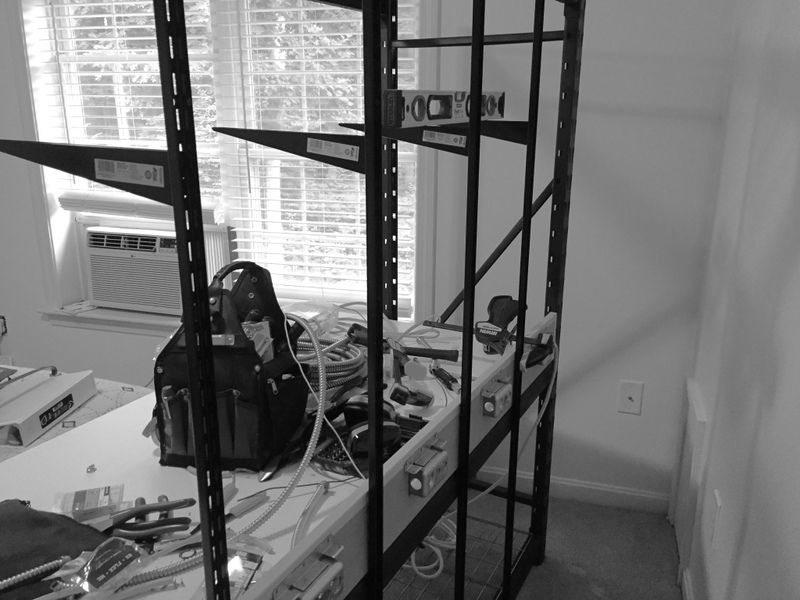 With the cabling in place it was time to add the shelves and start installing the receptacles. I put each switch in front of the outlet where I wanted it to make sure things were in useful positions. On the backsplash from left to right I have: 20Amp Tamper Resistant (TR) GFCI outlet, 20Amp Decora TR Outlet, 20Amp Decora TR Outlet + 2 USB ports in the center, 20Amp Decora TR Outlet and another 20Amp Decora TR Outlet. The top left is an outlet for the overhead utility LED light fixture. Top right is a light switch which works out well as its just above where the light switch on the wall is for the room lights. I also ground the metal of the bench frame to the ground of this circuit. The LED light fixture is secured with more black plastic zip ties and the cord for it is secured in the same way. Install the switch and the LED light fixture. I was careful in my wiring to make sure everything downstream of the GCFI was cabled correctly and checked the ground using a receptacle tester like this one. Once you test it with live power make sure you test the GFCI and make sure all downstream outlets are cut off by the GFCI when it is tripped. 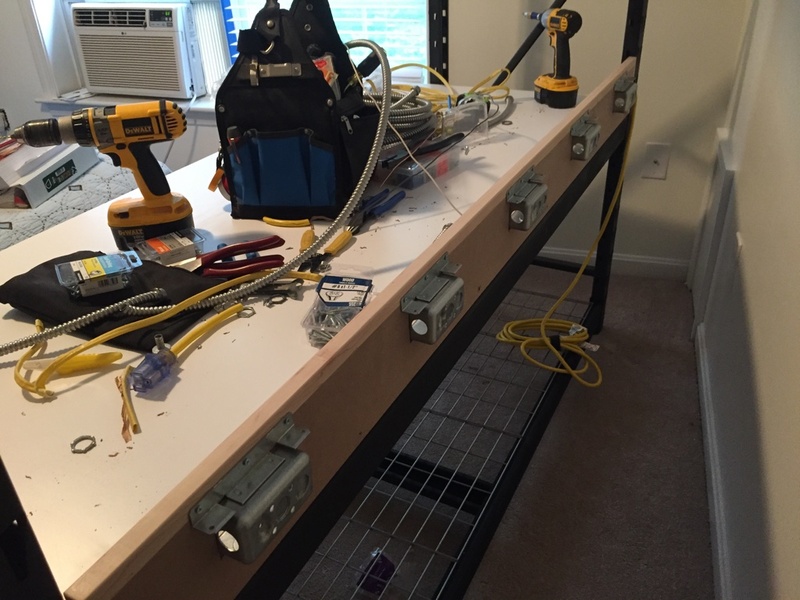 With the circuits all working it was time to put on the faceplates for the outlets and start loading up the bench. I have my ESD mat which is grounded out to the wall outlet so we don’t have a grounding loop. 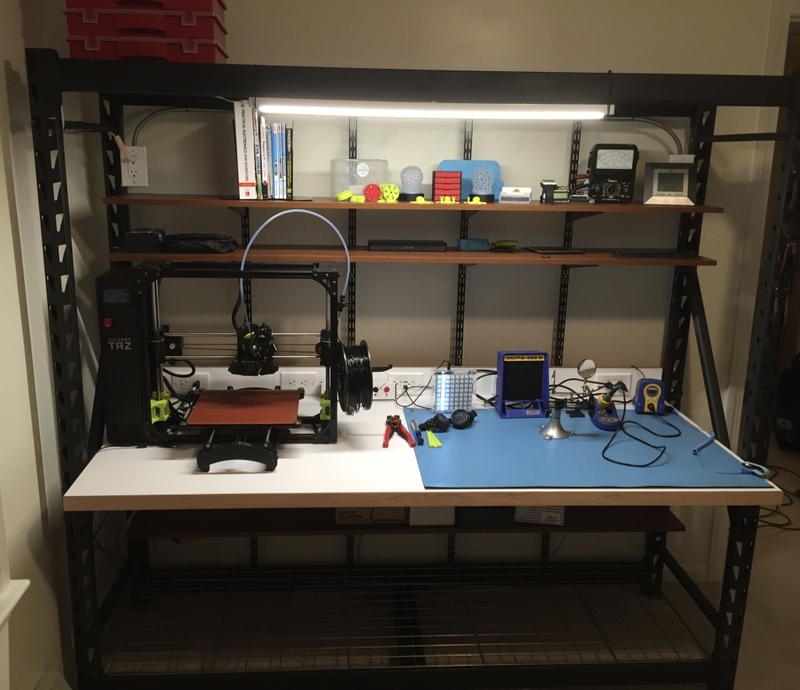 I have my Lulzbot TAZ6 on the left and my ESD mat, soldering stations nd fume extractor on the right. So far the bench has been working out well and it has been great to be able to leave a project on the bench and come back to it undisturbed. P.S. Since I completed the above bench I’ve also added 2 LED monitors and I’m working on a CNC controlled gaming keyboard tray, so please stay tuned for that in an upcoming post. Please consider following this blog via one of the ‘Follow this blog’ widgets on the webpage or via my Facebook Page or Twitter Feed.